Chasin' Mason: Christmas in July! About a month ago, Courtney and Jenny posted about this fun little "Christmas" present exchange they were hosting. When I first read about, I thought it sounded so fun! Plus, on top of the little toddler birthday exchange I set up earlier in the month and Mason's actual birthday, why not make July even more fun?! You can never have too many presents, right? I got paired up with Jenesha from books, looks, and babies...oh my! It was so nice getting to know her and Mason was beyond excited when he saw the gift that she sent in the mail! Jenesha had wrapped things in cute little packages. I gave Mason the first one and he immediately ripped in to it. The first package had the cutest books in it! In the next little package was the Little People Wheelies Jet and Helicopter. Mason went crazy! I had to open it immediately and he instantly walked over to his wheelies roller coaster and sent them "down the slide". I don't know how they are different than the other ones that he has but they went SO FAST down the slide. He was laughing and having the best time. 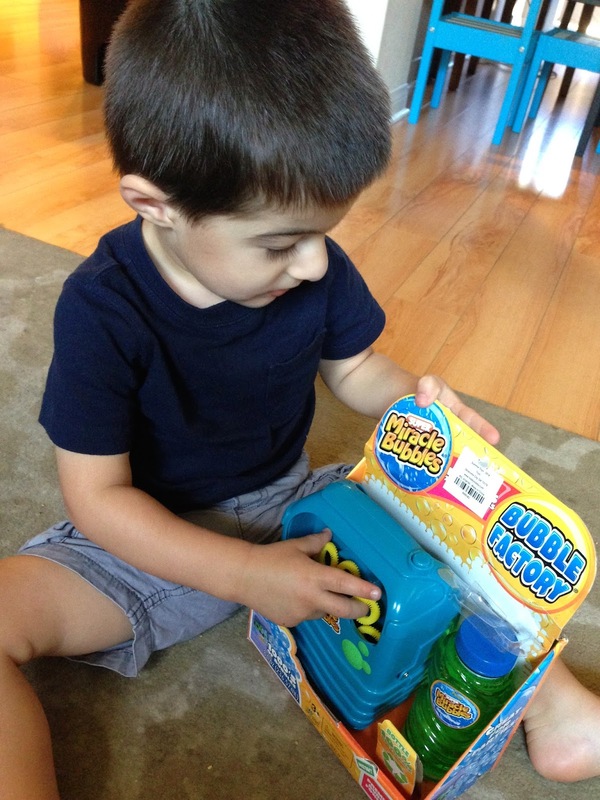 And then the gift of all gifts : the bubble machine! 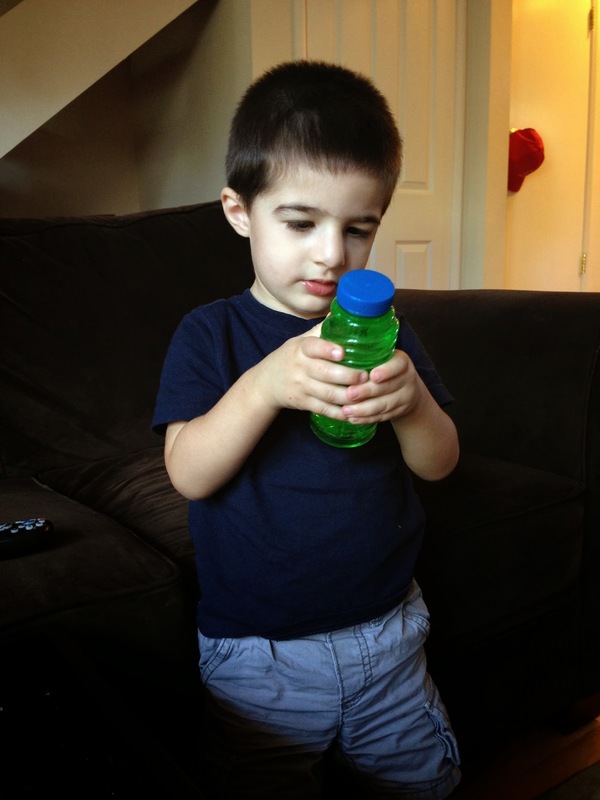 Mason can recognize a bubble machine from a mile away! Miles away! I couldn't open the package fast enough for him. He kept handing me the bubbles and wanting me to fill the machine and turn it on. Unfortunately I had to break his little heart momentarily because I had plans for us to go to the park and have a picnic dinner, but don't worry. He got to play with bubbles until his little heart was content only a few hours later. We kinda did things in the reverse way and opened the card last (oops!) but it was so cute. 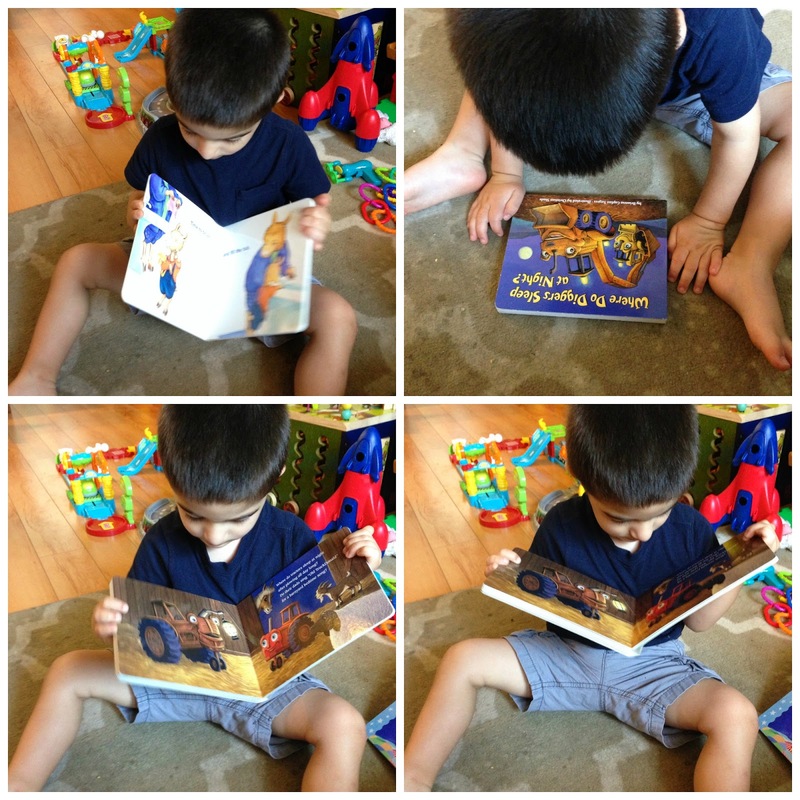 Mason looked at it intently and kept opening and closing it like he was reading a book. Not pictured are cute Planes stickers and a Planes Golden Book. Seriously, I don't know how Jenesha did it. I swear it's like she's known me and Mason forever. Her gifts were absolutely PERFECT. Thank you Jenesha, Adrienne, and Ellyn! Mason and I were paired up with Jenny (one of the co-hosts!) and her daughter, Callie and we had the best time shopping for a girl! Head on over to Jenny's blog, The Chronicles of We and find out what we got for Callie! Merry Christmas (in July)! And thanks for setting this up Jenny and Courtney! That bubble machine is amazing! We love bubbles too so I can totally get that obsession! That digger book is pretty impressive as well! so fun!! thanks again for joining us! I'm kind of jealous you remembered to wrap it! Chris was like 'did you wrap up the presents in christmas paper?' soon after we got back from mailing it off. I was like noooooooo where was your idea BEFORE I sent it?! It didn't even cross my mind. That would have sent it over the edge into elite, gosh darn it. Next time! must remember. Jenesha did SO well picking out stuff your Mason haha! Too bad you had to break his bubble wishes mom. ha. I broke Aria's bubble machine not too long ago, poor kid. Deprived of bubbles ever since. haha I just noticed the wrap is Jake and the NL pirates Christmas wrap, haha that is amazing! So girly =) What are you a boy mom or something!? What wheelies ramp do y'all have? The one we have doesn't work with the planes - they fall off the side. I'd love to get one that works with those. Such a fun gift! I love those books. We don't have either of them yet, so I think I'll add them to the boys' Christmas lists! Fun gifts! Who doesn't love a great bubble machine!? Probably mom more so than little! ;) Oh and we open the cards last too. Merry Christmas....in July! Oh my gosh, he's so cute!!! I'm so happy he liked everything :) that bubble machine has rescued us from a few crabby afternoons, so I hope he enjoys it! You scored some AWESOME stuff!! So awesome! We, too, opened the card last. And it had a message not to open one of the gifts which was part of a DIY. The other part was coming separately. Oops! You got great pictures of Mason. What a fun swap! !